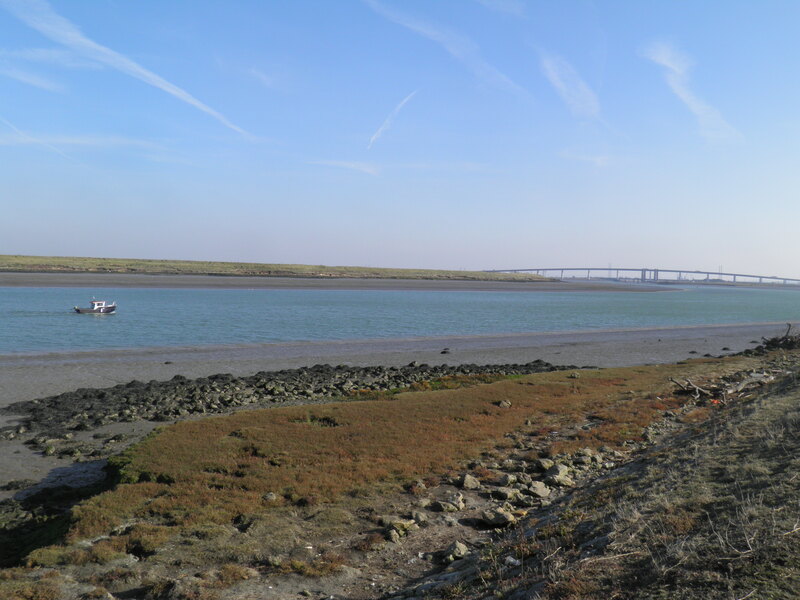 A route winding through low hills, paddocks and orchards to reach the vast skies and immense marshes and mudflats of the wildlife-rich Medway backwaters, either bleak or sparkling depending on the weather. A walk for those who don’t mind a bit of heavy industry on the skyline, though never any closer than that. Underfoot: Field paths and levees across marshland. Many of the fields could be muddy after rain – walk best done after dry weather. Terrain: A few gentle, short climbs. A few points of difficult route-finding due to missing or inaccurate waymarks. Maps: 1:50,000 Landranger 178 Thames Estuary; 1: 25 000 Explorer 148 Maidstone & the Medway Towns and Explorer 149 Sittingbourne & Faversham. Getting there: Newington is served daily by hourly Southeastern services from London Victoria (63 mins) via Bromley South (46 mins) for connections from London Blackfriars via Elephant & Castle and Peckham Rye, Rochester (16 mins) for connections from London Charing Cross via London Bridge, Lewisham and Woolwich Arsenal and Rainham (4 mins) for High-speed connections from London St Pancras via Stratford International. 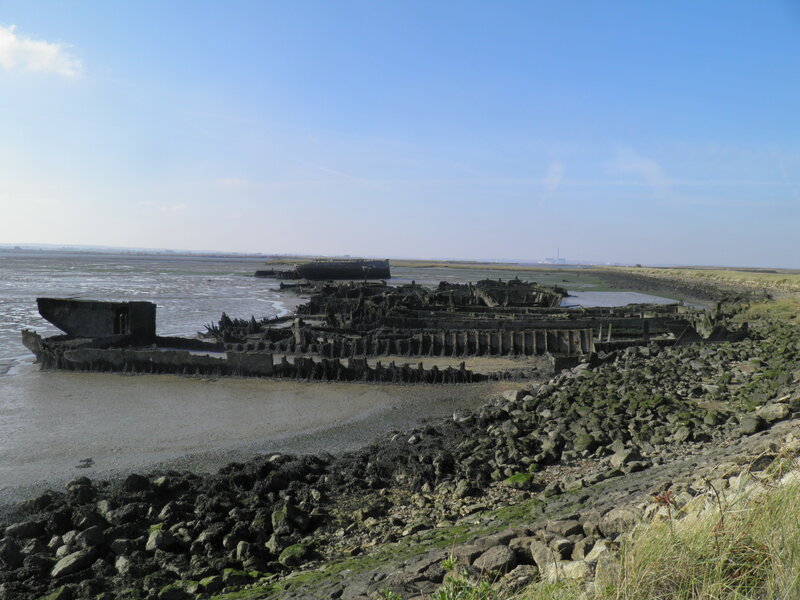 Useful websites: Much of this route follows the waymarked Saxon Shore Way. 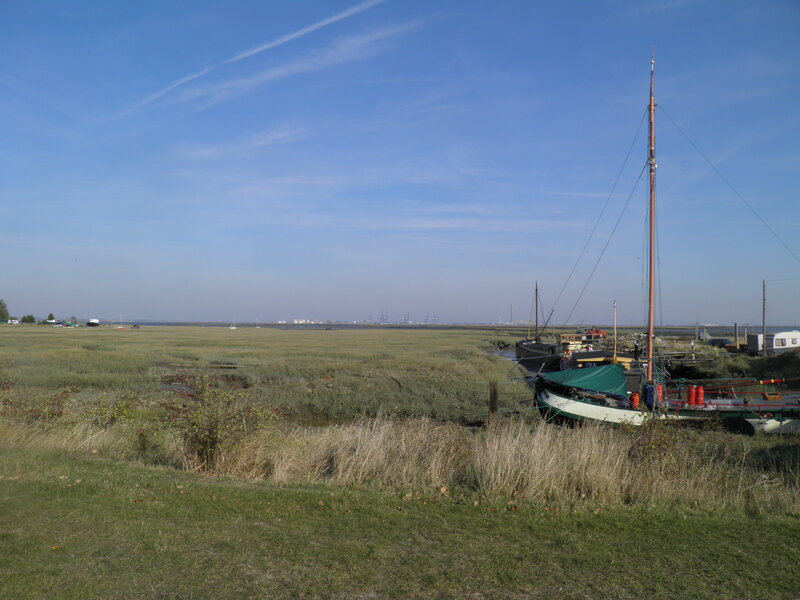 Lower Halstow is home to the sailing barge Edith May, which becomes a floating tea-room during the winter. Getting home: Swale halt is situated on a branch line, with half-hourly services (hourly on Sundays) to Sittingbourne (9 mins). All trains from Swale connect at Sittingbourne with a service to London Victoria (67 mins) via Bromley South (50 mins) and a high-speed service to London St Pancras (59 mins) via Stratford International (52 minutes). Both Victoria and St Pancras services call at Rochester for connections to London Charing Cross via Woolwich Arsenal and Lewisham. Fares: The cheapest option when travelling from the London area is to purchase a day return to Swale (£19.20, child £9.60, railcard £12.70). If you want to use the High-speed services from London St Pancras or Stratford (this requires a change at Rainham to reach Newington), slightly higher fares apply (£22.40, child £11.20, railcard £14.80) – ask for your ticket to be ‘Plus High-Speed’ or select that option on the ticket machine or website. Arriving from the London direction at Newington station, cross the footbridge and exit the platform, walking straight ahead along Station Road to reach the main road (High Street) at the end. Turn right here for around 200m (this is the A2, previously both a Roman road and Anglo-Saxon Watling Street). 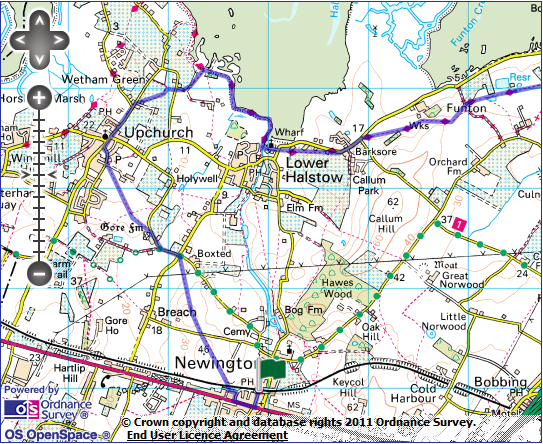 At bottom of small hill, turn right on Wickham Close and after 50m left (still Wickham Close). Immediately after the fenced water pumping station, turn right on the narrow path under the railway bridge and into the open fields beyond. A clear path cuts diagonally across the field, climbing gently, with views opening up in all directions. The 15th century church tower of St Mary Newington nestles amongst the trees to the east, and as you crest the hill, you get your first panorama across the creeks of the Medway backwaters and across the river to the power stations at Kingsnorth and Grain on the Isle of Grain, in reality a peninsula separating the Medway and Thames estuaries. A kissing gate leads out onto a minor road which you cross straight over and follow a fenced path between paddocks. A second kissing gate leads into a larger field, where an unclear path continues at the same angle to a well-hidden stile in the hedgerow ahead. Follow the edge of the apple orchard ahead and at corner of orchard (it is easy to lose the route here) follow the faint vehicle track descending the rough grassy area to the next fence. Turn right between the fence and the trees of the orchard to locate a kissing gate into the field to the left. A further three such gates lead across the fields to Boxted crossroads. Take the lane straight ahead (signed to Upchurch), keeping right at the bend by a mobile home site. Just past the polytunnels of Maxwell Lane Nursery, turn left over a signposted stile well hidden in the hedge. Follow a fenced path up the low hill, over a stile and veer right, still on the fenced path. 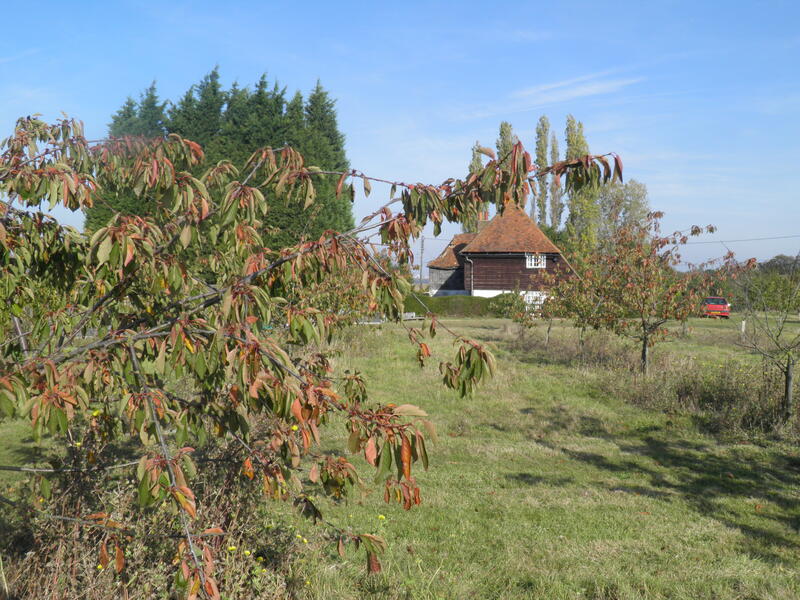 Having walked around two sides of the field, turn right over a stile and immediately take the path waymarked left, through a scrubby area of woodland and then through more kissing gates across paddocks towards the houses of Upchurch ahead. Emerging on Chaffes Lane, turn right into the centre of the village. By the Co-op store, turn right again to reach the church. The village’s church, with a distinctive so-called ‘candle-snuffer’ spire (probably designed as a navigational aid for shipping) dates from the 14th century. It had the distinction of having Sir Francis Drake’s father as its vicar from 1560. Past the church, at the road junction by The Crown inn, keep straight-ahead on The Street (signed to Ham Green), past the well-stocked greengrocers and soon leaving the village. About 500m on from The Crown, just past the junction with Poot Lane, turn right over a waymarked stile which leads off the access area to a large agricultural shed. 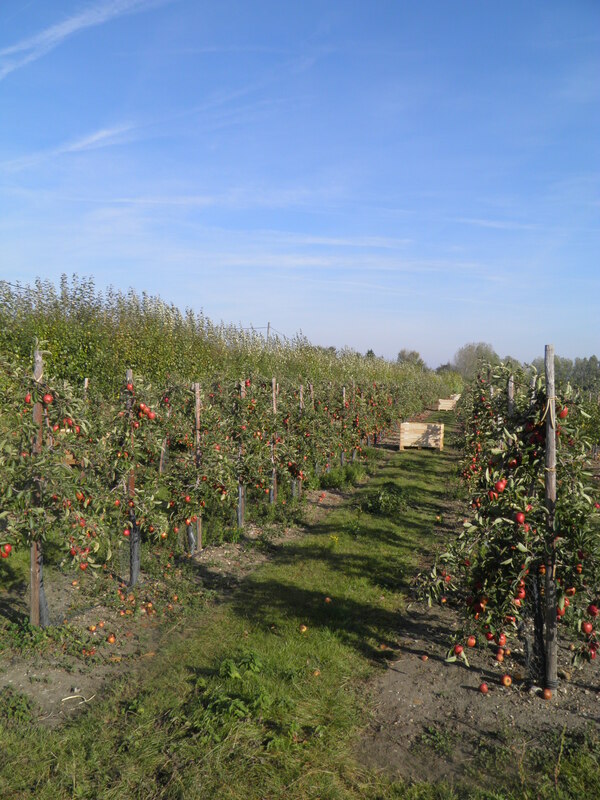 A diagonal path leads through the apple orchard. On reaching a windbreak of tall trees, pass it and then immediately turn left alongside it. On reaching the second telegraph pole turn right along a broad gap between the trees to a road junction (note that this last part is not marked as a public right of way on maps, but is waymarked on the ground). opening up to your right is a fine view of Halstow Creek and beyond it your eventual goal of the gracefully curved Swale Crossing. Follow the track to reach the fine collection of residential Thames and Dutch barges tucked away at the very head of Twinney Creek, floating only at the very height of the tide. Where the gravel track veers left towards the wharf buildings, keep straight ahead along the top of the grassy levee, for the first time following the waymarks of the Saxon Shore Way. winter she becomes a moored tearoom, open Thursday – Sunday. 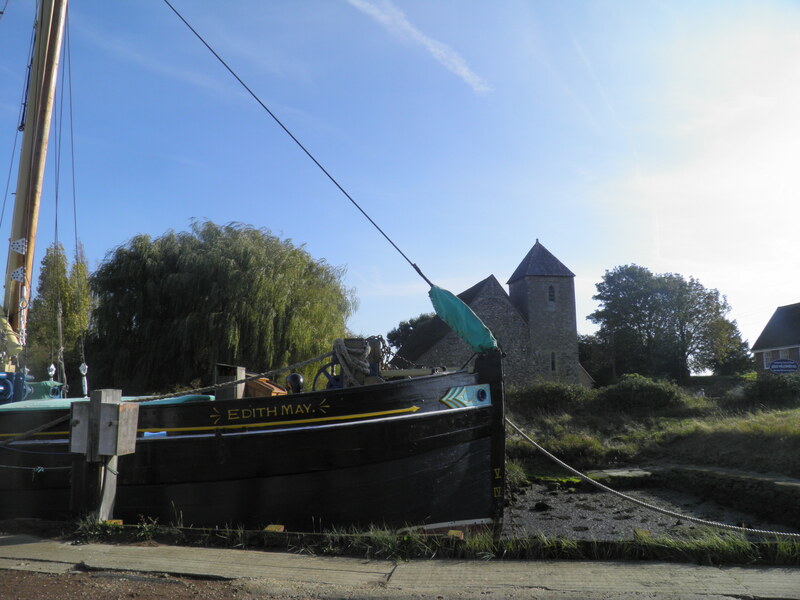 Walk along the quayside, over the levee ahead, down steps and turn left on tarmac path over the bridge to reach Lower Halstow’s attractive church. 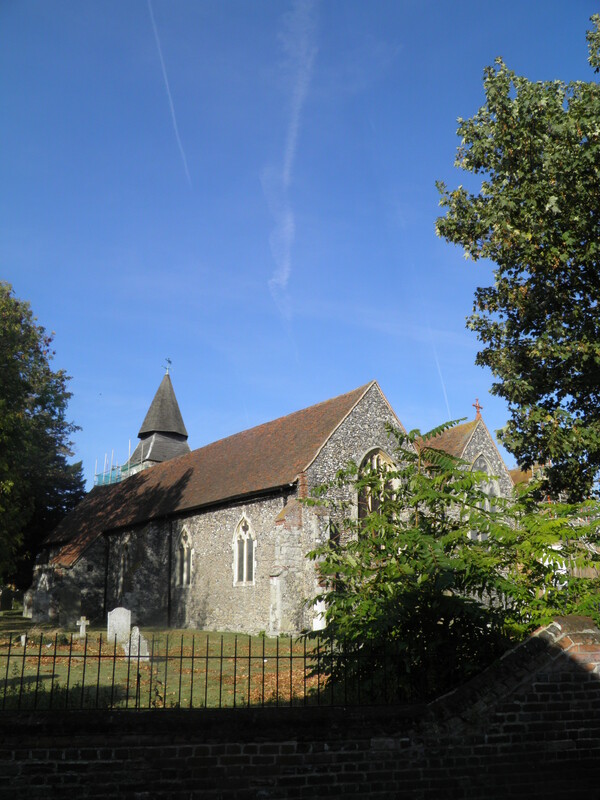 The church of St Margaret of Antioch, beautifully situated next to the creek, dates in part back to the 7th century, with its construction purloining sections of Roman tiles from a villa elsewhere in the village. The first recorded parish priest was the nephew of St Thomas a Becket. Past the church, the path becomes a small road which leads out onto a busier road. Cross, and follow the signed fenced footpath ahead. After another series of kissing gates across paddocks, the path cuts straight ahead across an orchard and regains the road by Barksore Cottages, turning right. Take care following this busy and narrow road past Barksore Farm. At the junction with Basser Hill turn right, then immediately left on a signed path across a field of kale. A clear route is marked by a line of crops left unharvested, bringing you before long to a point just above Funton brickworks. Funton brickworks, still operational, produces a well known range of brick bearing the Funton name using the local clay. These ‘yellow’ London bricks, historically produced by many small brickworks around the Medway, give the distinctive colouring of many Georgian – and more recent – London streets. The path now veers right uphill, bringing you to another section with slightly tricky navigation, often not helped by crops being planted across the path and no route being left. At the top of the rise, again with fine views across the estuary, keep the small wood to your left. At the end of the wood, cut straight ahead across the field to reach the tree-lined track ahead. 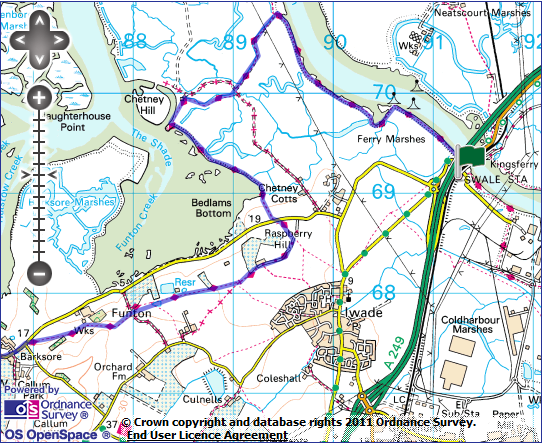 Here, follow Saxon Shore Way waymarks to dogleg left along the track and then right along the top of a pear orchard. suddenly seems much closer, with the modern houses of Iwade appearing to the left as you head across the second field. At the end of this field, you need to contend with inaccurate waymarking. 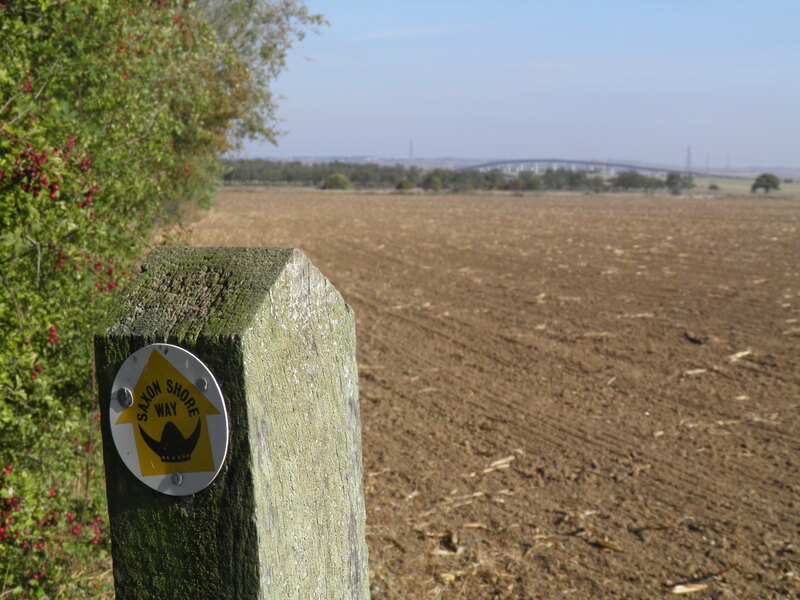 The Saxon Shore Way does not veer right towards Iwade, as the marks suggest, but rather keeps straight ahead, following the field boundary towards the orchard and farm buildings. At the end of the field, a kissing gate leads out into the yard of Raspberry Hill Park and you keep straight ahead along its access track. 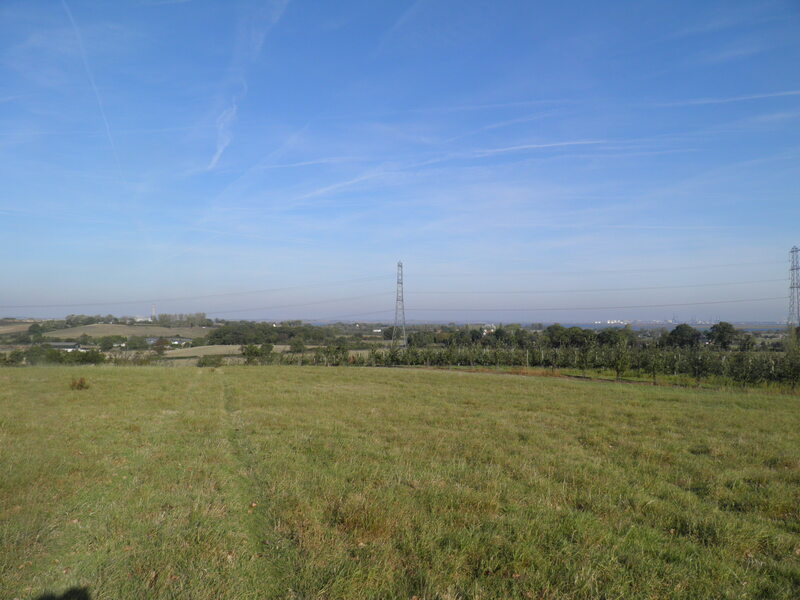 The track loops across the grassy fields – the chimneys and steam from Kemsley paper mill now prominent on the horizon. At the brow of the hill, you come to a kissing gate on the right. Do not pass through this, but instead turn left across the field, heading for a gate onto the road just to the left of an isolated tree in the far hedgerow. Cross the road and follow the path down the tussocky field, passing a long bench with a fantastic view across the creeks and marshes. Through a kissing gate, you pass onto the top of the levee, with the channel to the left and the wetlands of Chetney Marshes to the right. 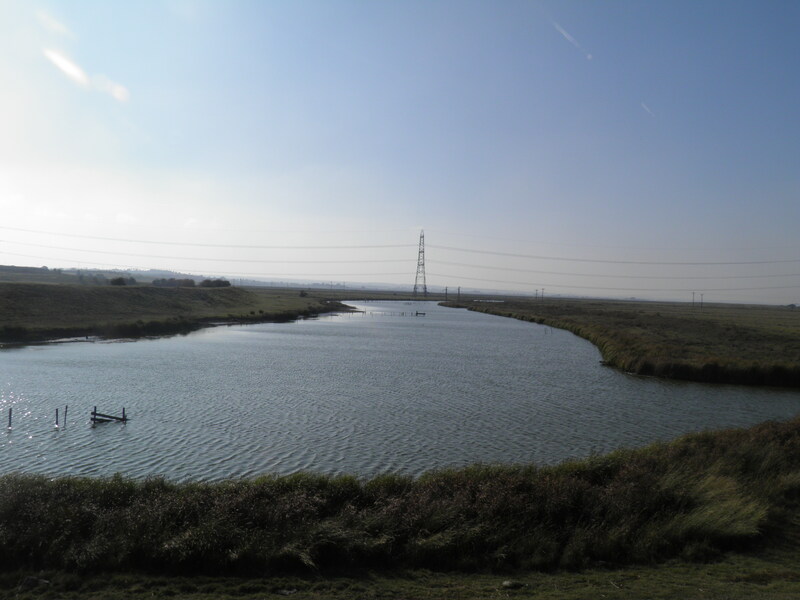 Chetney Marshes are thriving with wildlife, including migratory birds, waders, kestrels, herons, rabbits and other small mammals. One winter afternoon, a stoat wandered along the levee in front of me, only mildly interested in my progress. from the low island rather optimistically known as Chetney Hill and then along the fence towards a small group of barns. By the gate into the barn enclosure, turn right again along a low levee cutting across the heart of the marshes beside a small drainage channel. You eventually arrive at a small tarmac road. Cross straight over and take the white gravel track ahead. 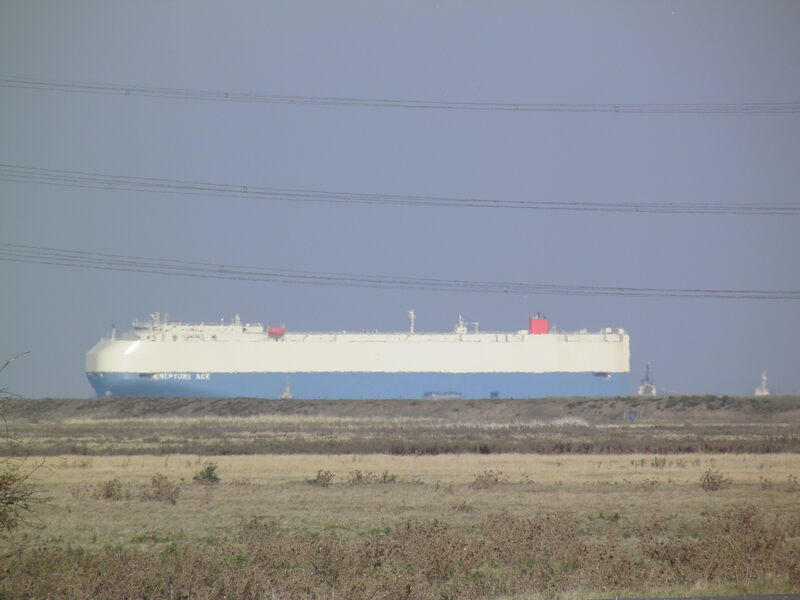 There is now a slightly dull 500m ahead, before you pass under the pylon line and emerge beside the Swale, the broad tidal channel separating the Isle of Sheppey from the mainland. You turn right along the side of the Swale, now clearly on the homeward straight as the two bridges slowly get closer. 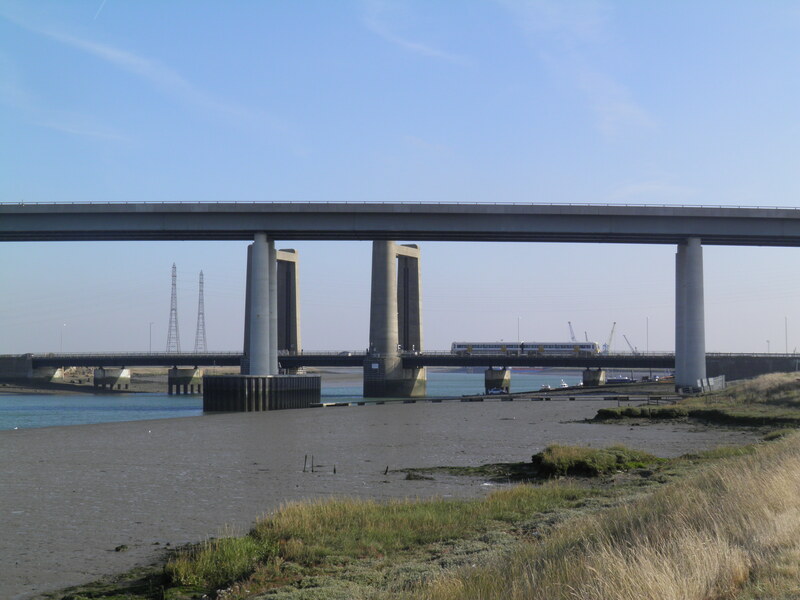 The high Swale Crossing was constructed in 2006 as a relief for the bottleneck of the combined road and rail Kingsferry Bridge, which slowly comes into view behind the Crossing. The Kingsferry Bridge, much lower that the Crossing, lifts vertically to allow shipping through, sometimes as frequently as 20 times a day. After around a mile, the levee loops around Ferry Creek – having passed through the kissing gate here, turn left through a second one and head back towards the main channel of the Swale, here marked by green and red beacons. cross the tarmaced area and pass through the rusty gate (although it may look locked, the footgate will be open). Turn briefly left along the road and just before the rail and road bridge climb a dilapidated set of steps to your right and hop over the crash barrier at the top (To avoid this, turn right on the road to the roundabout, and then head back along the road towards the Kingsferry Bridge). Turn right, and after 50m cross to reach the isolated single platform at Swale halt. In 2005, the then Strategic Rail Authority proposed closing Swale, or at least reducing it to a token service. Given it serves no settlement and you will almost certainly be the only people boarding a train here, you can understand why. Nevertheless, Swale was saved, and continues to receive a train every half hour in either direction!